Despite leading the two-time defending Premiers at every break, the Dingos couldn't stay ahead for the one that mattered, losing a nail-biter to the Broadview Hawks by 7 points. 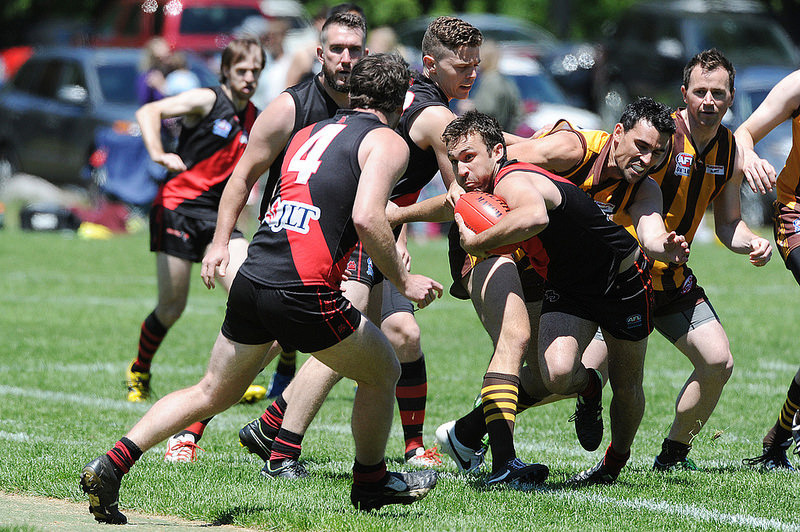 Coming into their Round 3 clash against the Broadview Hawks, the Dingos were looking to erase the memory of a poor 4th quarter against the 'Roos and bounce back with a full 4-quarter effort against the undefeated Hawks. Despite missing a few of their regular Canadians, the Dingos were confident that they could match up against the Hawks and control their big guns. And in the first quarter, the Dingos did just that, alternating goals with the Hawks and putting pressure on their defense with great work out of the middle by Thumper, Alex, and Shauny. Sitting on a slim 1-point lead at quarter time, the Dingos pushed hard with the wind in the second quarter and gave their forward targets Wade and Fridgy plenty of opportunities. In his first game of the season, veteran Jimmy Duggan had plenty of run off of the back flank, while rookies Niall, Mike, Simon, and Brewski all made big plays to extend the Dingos' lead to 4 goals at halftime. The second half was a different story, however. The Hawks began chipping away at the Dingos' lead and the boys lost their focus in key moments. Despite strong efforts from ruckman Tom Bell and Big Butch up front, the lead was down to 2 goals at 3-quarter time. And in the fourth, the Dingos simply could not stop the Hawks or put any pressure on their backline, as scoring opportunities dried up. The siren sounded with the Dingos down by 1 point and one last scoring shot by the Hawks was the final insult in a difficult loss. Despite the outcome, coach Robbo told the boys to hold their heads up and know that they pushed the two-time Premiers to their very limit. With a full four-quarter effort, the Dingos can beat anyone in the AFLO, but it will require focus and effort to the very end. Next up, the Dingos will try to regroup against the High Park Demons. The Dingos' Div 2 squad had to wait patiently through the first two weeks of the 2015 season before they finally got their first crack at the action this past weekend, and boy did they make a show of it. Squaring off against the somewhat undermanned Toronto Rebels, the match was a decidedly one-sided affair, as the Dingos raced off to a big lead and never really looked back. Leading the way were veterans Paul Tinkler and Alvin Ranchhod, who each bagged 5 goals each while leading the way on the field. There was ample sharing of the pill, as 7 different Dingos got on the scoresheet, with a 20-goal total stacked up on the scoreboard by the end of 4 quarters. BOG went to Gilesy, who was thrown into the ruck and seemed to shut down the midfield all by himself.